Hope everyone is having an amazing summer. Just thought I’d let you know that there is a new stamp set in the store. Farmhouse Flowers is inspired by the old fashioned flowers that were in farmhouse yards – sturdy, self seeding and beautiful. This image is printed in a dark brown and colored with Copics. I used the R-30 series (R-30, 32, and 35) and blended in some RV-02 and added RV-0000 for highlights. The green is YG-91, 93 and 95. I also added some vintage Photo Distress ink to the paper edges to make it feel a little more vintage. 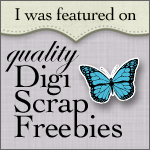 The patterned papers are digital papers from the Gardenologie scrapping kit by Quirky Twerp Designs. Right now, Farmhouse Flowers is a new release at the Digichick. So for Thursday and Friday you can get it for 20% off. This entry was posted in Digital Stamps and tagged DigiChick, Digital Stamps on July 28, 2011 by Cathy. Love it! Pinned it to my Pinterest board for inspiration.